Our Anodized Aluminum Labels Outlast the Worst Weather | Data Graphics Inc. Our Anodized Aluminum Labels Outlast the Worst Weather | Data Graphics Inc. When you need a label guaranteed to perform in the harshest conditions, you need anodized aluminum labels from a company with decades of proven experience. Heavy equipment manufacturers and all five military branches trust our reliable products, including our aluminum labels. 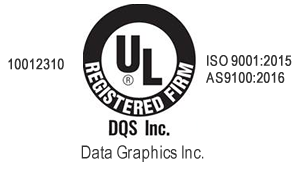 Anodized aluminum labels from Data Graphics are designed to withstand the most extreme environmental conditions. We manufacture our custom aluminum labels to weather the effects of sunlight, salt spray, high temperatures, cleaning solvents and abrasives. Unlike other materials, thin and flexible anodized aluminum label will not crack, chip or peel off over a long period of time. If you own expensive equipment, we can help you protect it from theft. Our anodized aluminum is often used to create product identification and “property of” labels that many big-name companies trust. We have over three decades of experience and can make durable anodized aluminum labels to display serial numbers, barcodes and UID. Our permanent custom labels protect your products, so you can focus on serving your customers. 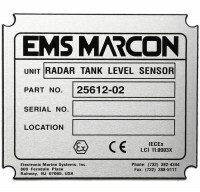 Many companies in the aerospace, medical, manufacturing, military and telecommunications industries choose our anodized aluminum labels to track inventory and equipment. Our clients include Disney, NASA and Boeing. Whether the label you choose is aluminum or not, everything we create is manufactured as if it’s being used on multi-million dollar equipment. We even perform a 100% inspection on every single piece in your order, not random batch checks like other companies. We feature the clean, precise facilities you need for exceptional product quality and variety. We can print your anodized aluminum label with a variety of color, size and shape options. Want to show your company’s logo? Our art department can display your company logo on a label for maximum brand identity. We precisely color match your labels using standard or coated Pantone colors. Need something that stays bright for many years to come? Ask about color-resistant products that don’t fade. , engraving. We can produce unique aluminum labels by cutting them out using a custom-shaped die. 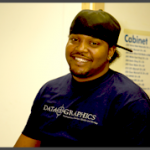 Whether it’s a circle, square, oval or another custom shape, Data Graphics can create the design you want. We can even include rivet holes, custom cutouts or strong adhesives on the back of the labels. Our anodized aluminum comes in various sizes ranging from .003 inches to .125 inches. Whatever your anodized aluminum label needs, contact our team for a quote on the custom label that will perform under any condition.